It was my second time to the Masai Mara, Kenya, and I was staying at the Olanana Camp, a beautiful lodge for safari goers built in the middle of the wilderness. I was interested in photographing the Masai tribespeople while I was there, but I needed to figure out a way to get to meet them and capture the sort of intimate shots that I had in my mind. 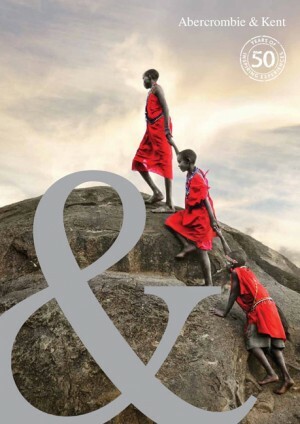 The Masai (sometimes spelt ‘Maasai’) are a tribal group of semi nomadic people located in Kenya and northern Tanzania who continue to uphold a traditional lifestyle and unique set of customs. They live in basic huts made from branches, mud and cow dung and they rely on their agricultural skills for survival, while living among wild animals in the Masai Mara reserve. I spoke to the Olanana camp’s English speaking naturalist guide called Julius, a Masai himself, and asked if he could arrange to take me on a trip over to a nearby village to have a meeting with the chief. Once inside a round hut within the Masai village, I tried my best to pitch my idea to the chief and his small council, allowing for Julius to translate as we went along. 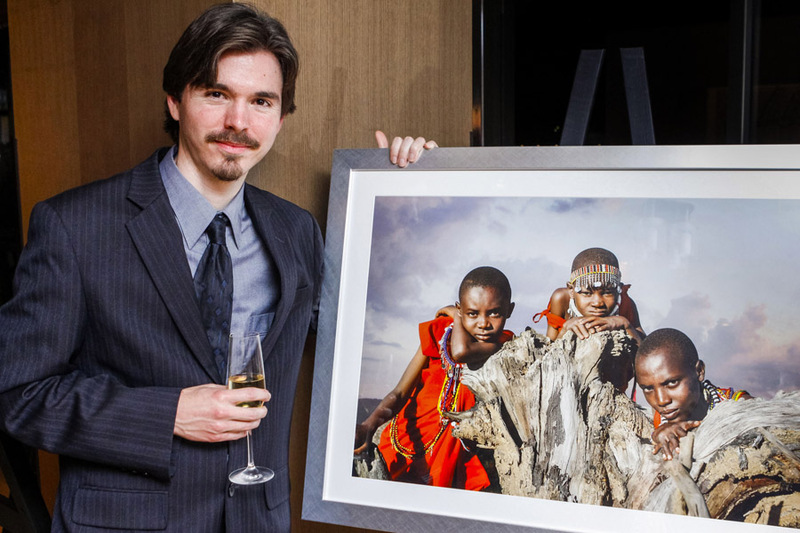 I explained that I was a photographer from Australia, and would like to take a series of photos of Masai people in their natural landscape, representing them in a beautiful and artistic style. I explained that I would be giving specific directions to them, such as where to stand and where to look, and I showed some of my Burmese and Bangladeshi travel photos to them off my small laptop so they could see my style of photography. I told them that I wanted a group of eight to ride with me in one of the camps safari vehicles for one hour in the late afternoon of the following day, and that I would give some money to the village for their time. They agreed. This was the second time that I have paid people to be in my photographs (the other was when I hired Burmese fishermen for one hour at sunrise on Inle Lake in Myanmar). 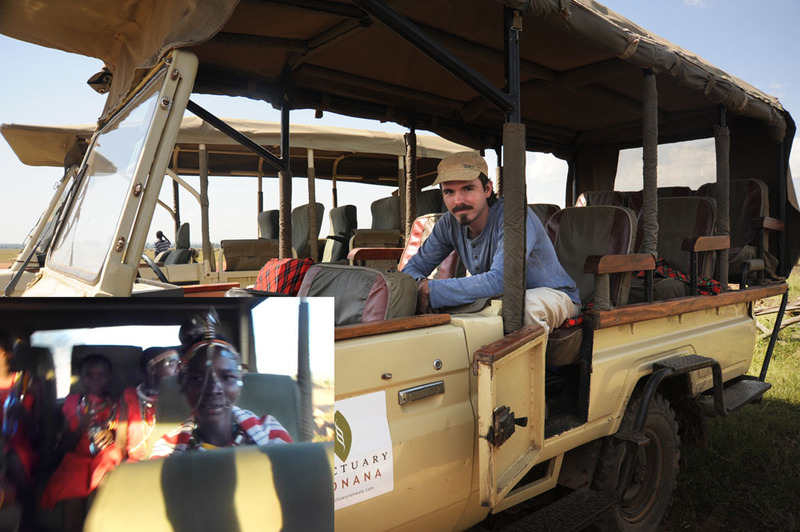 David in the safari vehicle, and the Masai filling the seats on the day of the shoot (inset). My translator Julius was going to be one of the three men – he had the classic tall and lean warrior physique and could translate my directions. The chief announced that he would also be one of the models. However, he was unfortunately not only on the short side, but had lost an arm in battle sometime ago with a lion. So I had to politely inform him that I was only looking for taller men. As for the women, I was told that we would go outside and he would round up all the ladies for me to choose from. Feeling a little awkward about this non subtle approach to choosing a couple of models – I very quickly asked two ladies I saw if they would like to be involved before too much of a scene was created. They seemed interested enough, and I asked them to find a couple of children to join the party as well. The next morning I went out with my driver to scout out some locations so I could make the most out of the hour that I would have with the Masai in the afternoon. 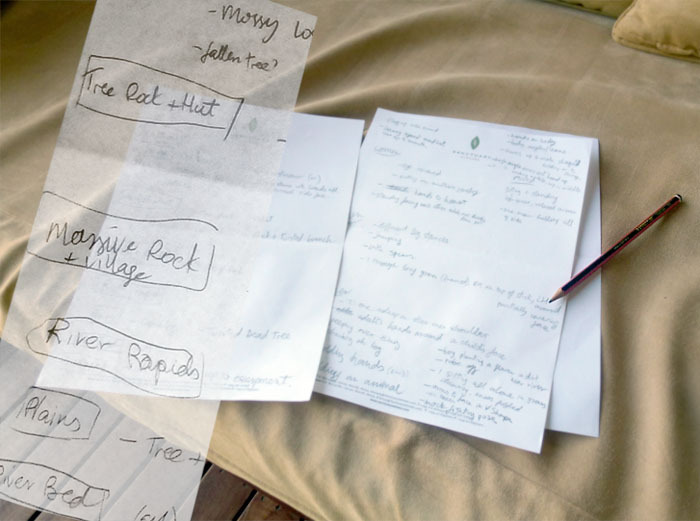 I took some photos and made notes of potential places that I thought could work: a river, an old tree, a hut, a large boulder, amongst other ideas. Back at the lodge I came up with the final list of locations and I also tried to imagine what I would like the Masai to be doing in the photos and how I might get them to pose. Making this list was useful for me so that I could have shot ideas in my mind already to work with. Location scouting at 11:00am (left) and the final shot taken very late afternoon (right) when the light was much more even. Location scouting at the large rock at 11:15am, and the Masai children making the climb in the late afternoon. We met in the late afternoon and began our drive in the safari vehicle to our first location, and I felt very exhilarated – my photographic plan was finally in action. I believe that a vibe of confidence from the photographer makes the subject respond well to direction and they can trust you behind the camera and become more involved. Because I am confident using my Nikon D700 we can move quickly, and no one gets bored or impatient. I take quite a lot of frames in a fairly short time, in the hope that one will be better focused or a stronger composition than the other, or perhaps the subject will have a better pose or expression. If I smile and appear relaxed in my nature, the subject will also be relaxed and it keeps the mood fun and hopefully enjoyable for everyone. The Masai heading back to the safari vehicle after taking some photos at the creek. I always work off a vision in my mind when I take portraits – I imagine the photo and set it up accordingly. Sometimes I have to think hard to come up with a shot, but once I know what it will be it is fun to try and execute it. I love to have people interacting or touching their surroundings, as it makes the photo look more natural and relaxed, perhaps as if the camera wasn’t even there. I’m always trying to think of natural and interesting body positions for variations in the photos, and not simply just having the subject standing still in front of the camera. In a close up portrait, I also like the idea of having something touching the face, such as material, a hand, a wall or some kind of surface. It helps to draws attention to the face and the eyes. As always in my travel photography, I have not used any flashes, lights or reflectors. Choosing the hour before sunset was a logical time of day to take the photos as the light wasn’t as harsh and unflattering such as when the sun is higher in the sky. An even quality of light is better to me, and I can use Photoshop to brighten any parts that I need to. When I’m editing the photos I try to imagine there was a light source such as a soft box lighting the scene, so I brighten the subject and the space around them accordingly, and let it get darker where the subject isn’t demanding attention, such as edges and backgrounds. 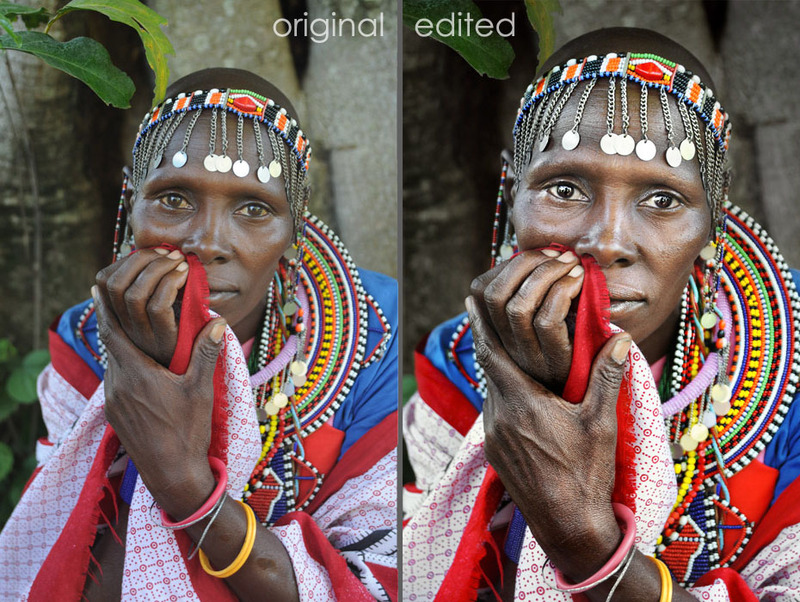 In this closeup photo of a Masai lady, I’ve done just that – darkened and desaturated the background so that it’s not competing with the main subject at all (you can see it is less yellow and less bright). I’ve cropped in for a better composition (no need for the excess space around her) and spent some time brightening her skin and eyes. On her skin and material, I have used a curve adjustment layer, where I smoothly enhance the contrast of highlights and shadows for a ‘punchier’ look. In photoshop, you can create a new adjustment layer in the layers window and choose curves. By putting two points on the line over the histogram and dragging them up or down to create a vague ‘S’ shape, highlights are boosted, the midtones are rich and the darks are stronger. Set the blending mode in the layers window from normal to luminosity if need be, so that the colours are not affected (only the brightness). The overall effect is probably too much for the entire photo, so you can make use of the layer mask which is the white box appearing on that layer, and invert it to black (control + i) and with a white brush, paint in exactly where you want this effect to appear in the photo. You can keep changing the size and opacity of the brush as you need so you never overexpose anything or crush the blacks too much. I repeat this process many times, targeting different parts of the photo (a different curves layer for the skin from the clothes, and a different one for the eyes for example). With the eyes, I have desaturated the yellow and blue tones out of the whites of her eyes to make them a more pure white. You can see there were catch-lights in the original (reflection of the sky through the trees) and I also like to make these nice and bright. 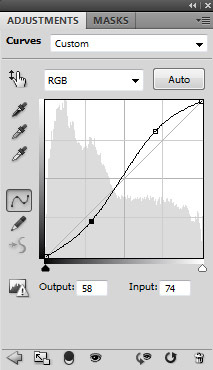 There are many ways to do this – curves, levels, exposure, the dodge brush. But it’s a matter of painting the effect in and that’s where using layers and layer masks can be very useful. There has been some sharpening on the important features and lines in the photo, usually the final step in the process. 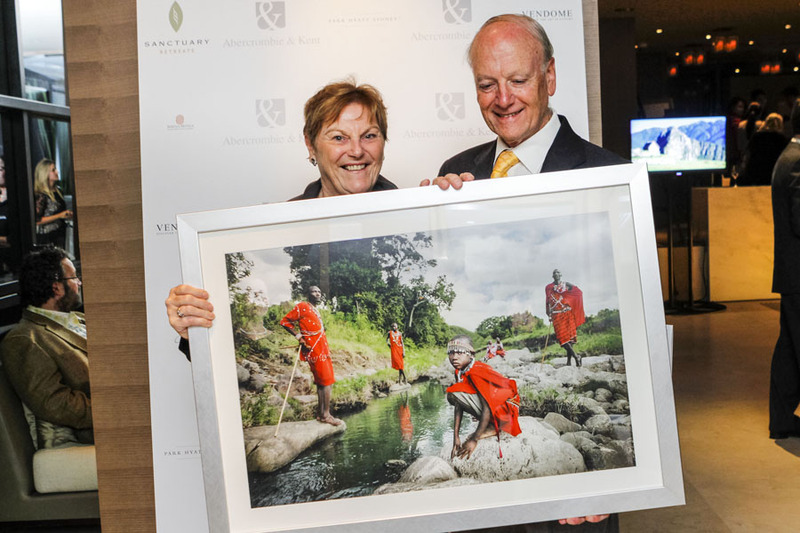 When I sent my Kenyan wildlife and Masai photos to the travel company Abercrombie & Kent, they told me they’d like to feature them in their 50th Anniversary event held in the Park Hyatt in Sydney overlooking the harbour and the Opera House. They would have 15 large framed prints on display for people to view throughout the night, and they would later be drawn as prizes along with a grand prize of a safari holiday in East Africa. 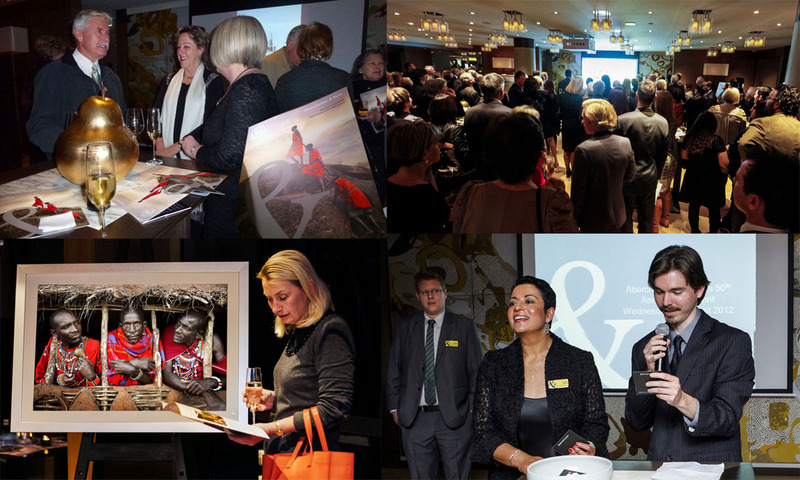 Proceeds from the ‘gift voucher’ purchases to enter the draw were going towards A&K’s philanthropy project to help develop schools in Kenya. Photos from the A&K 50th Anniversary night in Sydney. Photos courtesy of Kai Gee and A&K. Two Masai Boys from Kenya share a view with the Sydney Opera House in Australia. Mr and Mrs Smythe with their new Masai print. Photo courtesy of Kai Gee and A&K. 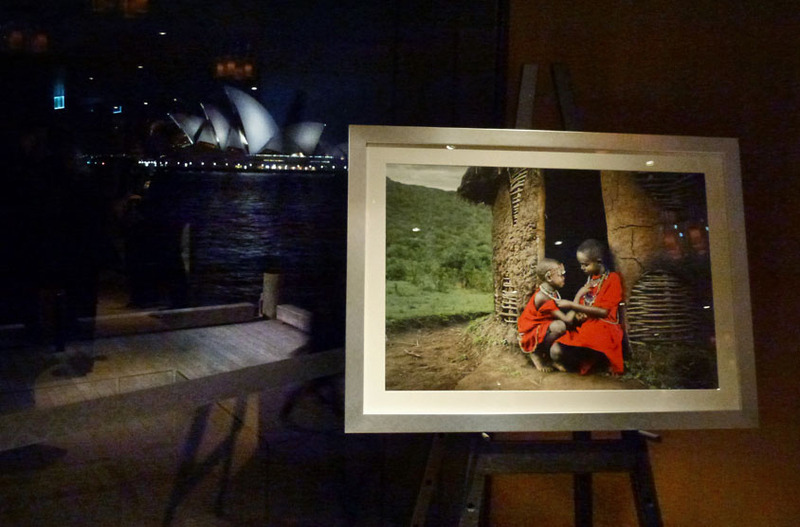 David Lazar with a print on display at the Park Hyatt, Sydney. Photo courtesy of Kai Gee and A&K. I had a fantastic night at the Sydney event and it felt great seeing and hearing all the positive reactions to the photos, and to know that my idea back at the Olanana camp and the Masai village in Kenya had been successful in the end. When my new friend Ly from A&K told me she was going over to Kenya to visit the same lodge a few months later, I asked her if she would visit the Masai village I had gone to and pass on copies of the prints to each person involved. She did so, and told me they were amazed and very happy to see themselves in the photographs, for some, it was their first time. 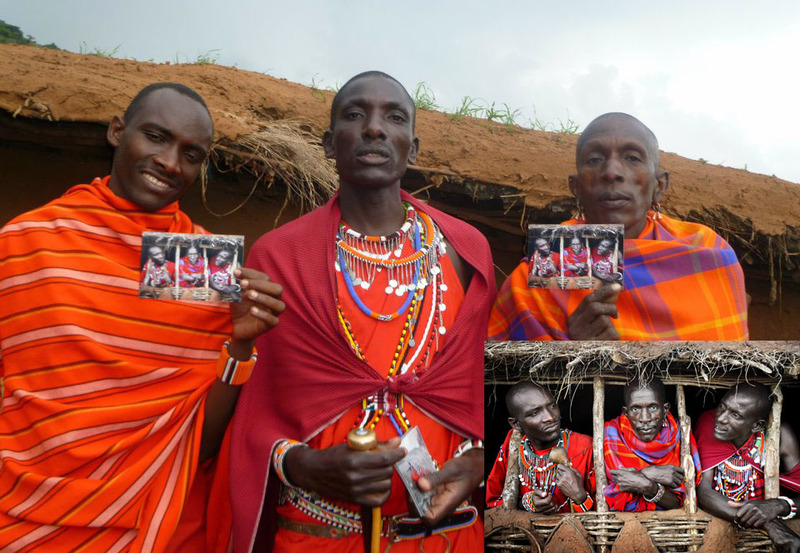 The three Masai warrior men receive their printed photos. Photo courtesy of Ly Nguyen. Hope to discover more of your work.. Sawatikrap! I simply want to mention I am very new to blogging and definitely savored this web page. Almost certainly I’m planning to bookmark your blog . You definitely have wonderful articles. Thanks for sharing with us your website page. n dats wonderful ….capturing moments n culture…!! you blog is always great! Excellent, Really Excellent, Go Ahead David, Wish You All The Best Always. Proud for you and what you’d done . Niice blog. My moment of pride is… well you can probably guess this one. I remember very briefly showing my favourite way of lightening images using the curves tool (which I’d just learned off a friend from Indiana only a day earlier – perhaps I need to show him this website to give him full props). Not often does anyone mix in new methods (even changes as small as using curves in their otherwise comfortable routine), so I’m rather chuffed that I influenced your process even in the tiniest way because evidently the sum of a hundred or so of these similar processes has received a very favourable response, if this website and those auctions are anything to go by! Looking forward to the next batch of Sth American scenes and wildlife! You did great justice to the beautiful moments you’ve captured.They look just as wonderful as they would’ve in person, if not better. I still remember the picture you’d taken of the Bangladeshi girl with green eyes, seeing which my respect for you had reached its utmost peak. Hi, great work David. Amazing. I have a question about lions on the road. Did you use a hidden remote camera on the road, or powerful lens and you photographed lions from far away? Or are there lions in friendly? How are these pictures taken? No I did not have a remote camera or a long lens – I relied on them walking right up to me in my vehicle on the road so I reality I was very close to them. The driver parked the car on the road ahead of them and we waited patiently for them to approach us. I used a 200mm zoom for that shot. Such a wonderful article. Thank you so much for sharing. My name is Juliana and I am Brazilian , I am beginner in photography and his work inspires me !!!! I will always be here to view the photos !!! Great photos! I don’t know if you remember me but i am your cousin and next time you come down to Melbourne we should catch up and you can teach me all your tips and tricks! Hi Nick of course I remember you, and thanks for your support with my photos. The next time I go down to Melbourne we will have to catch up! Thanks Alison for your words and glad you appreciated it. Your photographs are beautiful, but I am so dismayed that you refused to incorporate the honored man in the village and include him. My heart hurts at this. Do you look only for beauty, and ignore valor and highly earned respect? I hope you will go back and include him.